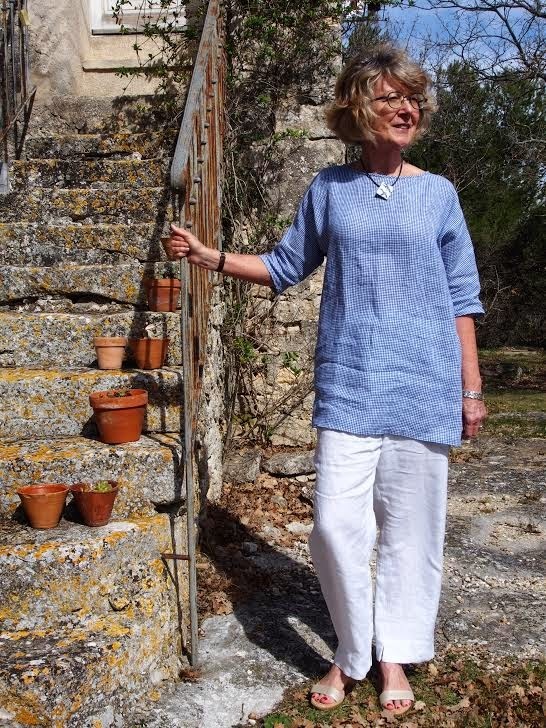 Sew Tessuti Blog - Sewing Tips & Tutorials - New Fabrics, Pattern Reviews: Our NEW Pattern - The Ola Tunic Top! 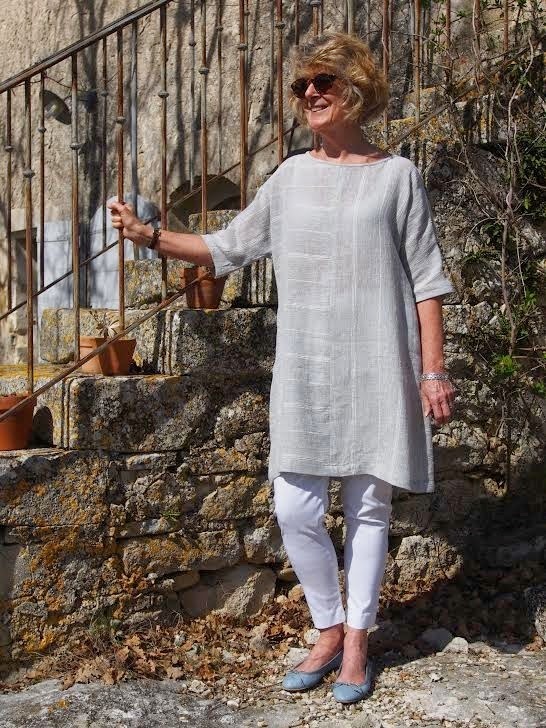 Our NEW Pattern - The Ola Tunic Top! As always, we're super excited to be finally introducing our latest Tessuti pattern - The Ola Tunic Top! This loose tunic-style top pattern comes complete with three style options and features magyar sleeves and exposed bindings on the neckline and sleeve hems. Here's the Ola Tunic - Version 2 (minus patch pocket) pictured above and below. As you can see, running striped fabrics horizontally on one half and vertically on the other gives a lovely subtle effect to the top. Truth be told this pattern was due out quite some time ago and Sheryl pattern tested Ola for us more than a year ago! At that time, she chose to make it up in Silva Stripe crinkled linen (top - sold out) and a blue gingham checked linen she purchased in France (below). Her most recent Ola make (above) was in our in Japanese cotton blend seersucker stripe Reading In Darkness (sold out). And so with that fairly extensive pattern gestation, we're very happy to finally be able to share Ola with you! Ola Tunic Top - Version 1 (above - made shorter in fine checked linen. There are three versions of Ola to try - plain (Version 1), two-tone with contrast patch pocket (Version 2), and a three contrast version with floating patch pocket (Version 3). Just as a final aside, some astute sewers out there (as we know many of you are!) might note that this pattern looks similar to our Zoe Top. While it does share some similarities - namely the magyar sleeves and general shape - there are some important differences. Ola's neckline is designed as a boatneck style. It also has a lot less fullness under the arm to allow for heavier fabrics. And of course, there are three fabulous versions available to you, giving you the opportunity to mix and match fabrics and designs. Please note that due to the Easter long weekend, hard copies will be available in our Melbourne store from Tues 7th April.